Our award winning curriculum provides quality courses in Citizenship in Action; Leadership Theory and Application; Foundations of Success; Wellness, Fitness, First Aid; Geography, Map reading, and Environmental Awareness; Citizenship in History and Government, and Cadet Safety and Civilian Marksmanship Program. JROTC also provides instruction in oral communication as well as staff functions and procedures. 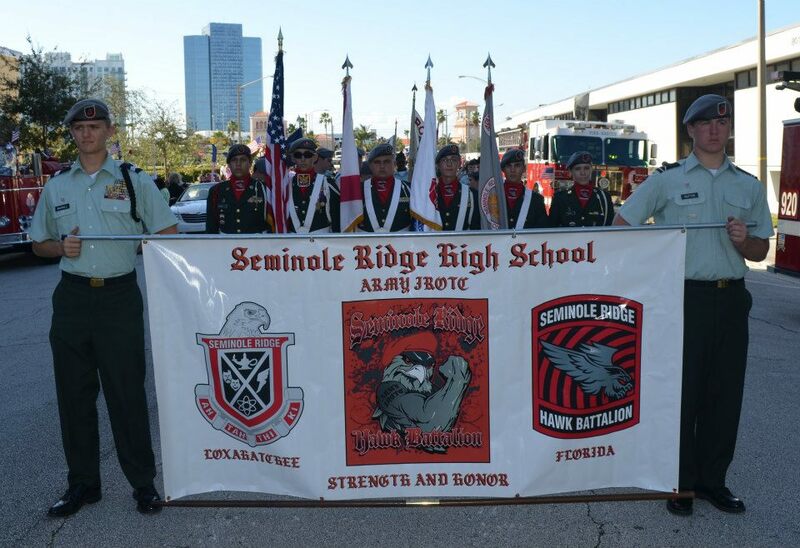 JROTC offers participation in various activities such as Raider Team, Color Guard, Drill Team, and Marksmanship Team. Varsity Letters can be earned for participation in those after school activities. All of these activities provide an excellent means of teaching discipline, leadership, and teamwork. Every summer Cadets have the opportunity to attend JROTC Cadet Leadership Challenge (JCLC), which is a weeklong camp. JCLC includes activities in Rappelling, Leadership Reaction Course, Map Reading and Land Navigation, Water Survival, and Challenging Outdoor Personal Experience (COPE) Course. JROTC provides a quality citizenship, character, and leadership development program, while fostering partnerships with communities and educational institutions. JROTC is all about Cadet Achievement. Upon completion, students are under no obligation to enlist in the armed forces; however, successful completion of the program allows entry into the armed forces at a two pay grade increase. The student’s Automotive course is taken as an elective course in addition to the required core curriculum. Students can earn credit for their HOPE and Fine Arts course requirements through participation in JROTC. Students participate in First Aid/CPR certification.